In March, still echoes the February snowstorms,and caring gardeners have flocked to its suburban areas to bring them in order for the upcoming season. It would seem that you can do in the garden in early spring, when the ground is still not warmed up and in the ditches and does snow? In fact, spring work in the country include an extensive set of measures to clean-up, tree care, soil preparation for planting. The first step is to remove from the garden, andgarden all serve as protection from winter frosts. Covering material or special constructions must be cleaned, washed, dried and put into the storage room until the autumn frosts. With beds, flower beds and garden area, remove the remaining debris from the autumn: windbreak, old branches, leaves, faded grass. Even if the cleaning takes place in the autumn, to spring back a little debris accumulates. It is possible that the first rays of the sunhatch and enemies of cultivated plants - weeds. As long as the roots are weak, sprouts can be easily removed from the wet ground. The heat begins to grow moss in damp places - algae. Short shoots can be easily removed with a stiff brush and the track of natural stone or brick with the first outbreak of a young moss can be washed with a strong jet of water from a garden hose. Any measures should be carried out with water at zero temperature, otherwise the cottage yard turns into a skating rink. 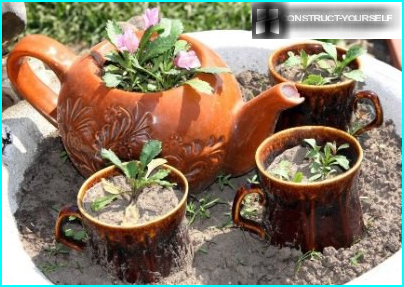 Containers, pots and planters will also needclean and restore their integrity when cracks appeared, and treat with herbicides. From tanks, which served as a place of wintering perennial flowers should get the old soil and replace it with a fresh and tubers and rhizomes of plants - dry thoroughly. 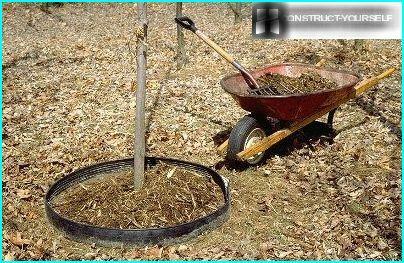 Mulching is carried out in flower beds, vegetable gardens andin the garden. A thick layer of mulch creates favorable conditions for plants, warming their roots in cold and protected from the scorching rays of the sun in the heat. It perfectly retains moisture, eliminates weeds, protects against harmful insects. Many crops (strawberries, cucumbers, zucchini, pumpkin) is less susceptible to rotting and increase productivity in the soil mulch. Do not forget the decorative effects: the soil mulch looks well-groomed and neat. 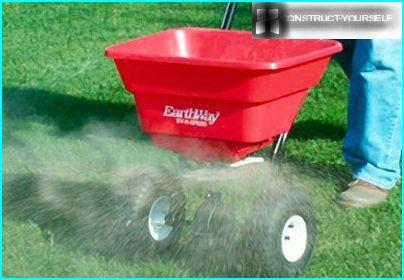 In March or April, spend fertilizing the soil, evenif it is considered to be rich and wealthy. Fertilizer the soil ensures rapid growth and high quality decorative flowers and herbs, a rich harvest of vegetables and fruit trees. Especially prized potassium, phosphorus and nitrogen, which are part of the universal complex fertilizer «NPK" "NPK". The fine granules are mixed with water or simply throw the garden beds with melting snow in strictly limited proportions indicated on the package. Read more in the article "How to fertilize the garden in the spring: by choosing high-quality fertilizer advice." 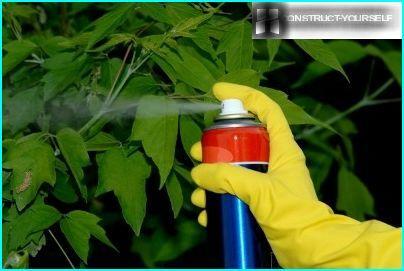 Simple garden work to care for shrubs and trees rejuvenate them, increase the yield and improve the appearance of plants. When the temperature broke the mark 0 ° C,became positive, but is still low, should produce a crop of fruit stone fruit trees and berry bushes. As a result of pruning trees should take a cup shape with an open center, which provides perfect lighting every twig and excellent air. Thinning the crown and shortening branches relevant in a time when the trees are no flowers, leaves, and even swollen kidneys. Together with the shortened shoots and the trunk. With the first rays of the sun, just rightafter the convergence of snow, should be planted saplings. Planting should be done until the trees are dormant, sleeping, that is, do not have kidneys, otherwise the seedlings will die, and not having lived a couple of weeks. Dig a shallow hole in the bottom of which is laid on top of it, and dung - a thin layer of rich soil. The roots of the seedlings are placed into the prepared hole, carefully added dropwise and slightly compacted soil underfoot. Drive a peg next to the seedling, which serves as a support to him the first time. Watered and follow to the ground around the roots do not dry out. Spring - the best time for vaccinationtrees. With the same success it is possible to spend budding (grafting the kidney) or kopulirovku (grafting cuttings). Cherenkov shoots are the most viable, because of kidney graft shoots hardly survive the winter. The most successful time for the Cherenkov radiation grafting is a gap between mid-April and the beginning of June. The operation was carried out vaccination knife or shears. One of the major impact of environment - close contact of stock and scion. Learn more about vaccinations trees can be found in an article entitled "Grafting fruit trees: a comparative review of the best ways to cross the trees." The division will be more herbaceous perennialseffective if performed in early spring. 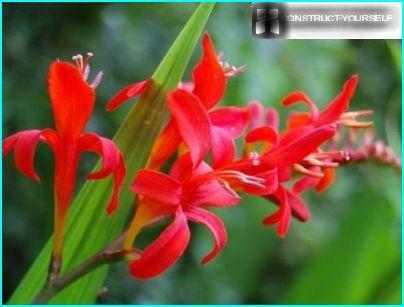 Thanks to him, increase resource planting material and updated the old plants that begin to lose color, wilt and rot. If the time to divide the rhizomes bells, asters, phlox, Crocosmia, then they will begin to actively grow and bloom is longer and more violent. Large bushes are divided into four conventional bayonet spade, putting them on the board. The place of dissection are gaps between the kidneys. small plant roots shared garden knife. Sowing and turf equally wellrespond to early feeding nitrogen fertilizers, which should be made immediately after the convergence of snow. Nitrogen in combination with phosphorus and potassium attached to the grass growing strength, so feeding can be carried out before the first sprouts. One of suitable fertilizers - "Chimera". The next stage - the aeration and combing. During the winter had accumulated a lot of debris and vegetation felt that impedes the growth and coverage. 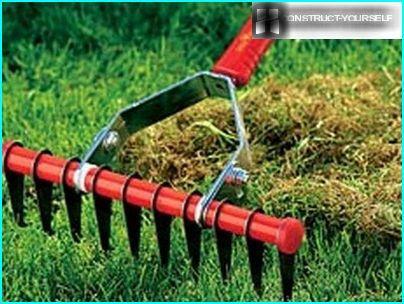 The most suitable tool for combing the lawn - electric vertikulyator carefully collects felt. To the dense soil does not become a barrier to air needed roots, use an aerator or ordinary forks, piercing them methodically ground. Toward the end of the spring should produce weeding. When a small amount of weed manual method is sufficient, otherwise use chemical weed herbicides. If the soil is light, sandy, warms up quickly,but it does not hold moisture, use the trench method is better. Clay soils are also easy to get warm, to the same perfectly retain moisture, so it is traditionally used for the raised ridge. 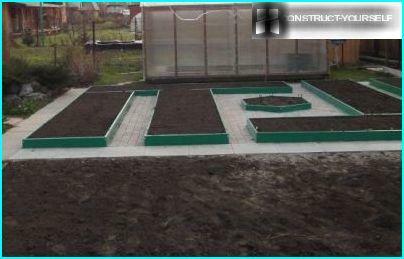 Several layers of manure, soil and compost, laid under the special scheme, bulk form ridges, which are called "smart garden." 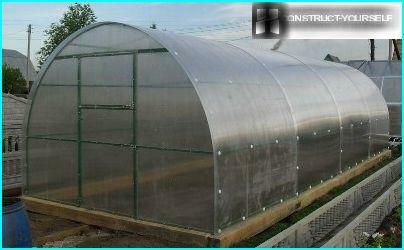 Ordinary smooth ridges used in greenhouses and containers where the landing is not enough free space. Unfortunately, with the advent of heat activatedinsect pests that can negate all the efforts of the hard working gardeners. 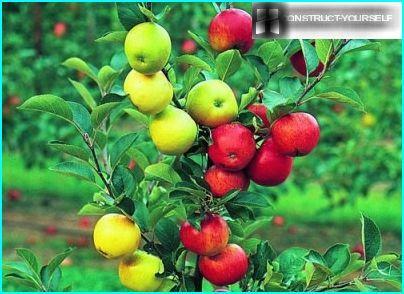 Many are attacked by fruit trees and shrubs. It is necessary to examine carefully all the twigs and pay attention to the bonded dry leaves. Perhaps this yellowtail jacks or Aporia Crataegi. They need to manually collect and burn. Zhukov weevils destroy cold days,when they are numb and stop moving. Under the tree lay a film, then shake the branches. Fallen insects burn. From moths and leaf-use infusion of mustard or wood ash. Sucker afraid of garlic infusion of tobacco. In addition to these types of spring work, there are many others, for example, planting flower crops, update garden furniture, cleaning ponds.